An exclusive opportunity to project your organization’s message to key international thought-leaders of sustainable tourism. A limited number of Promotional Tables are available, giving a unique opportunity to communicate your message efficiently to conference speakers, panelists, and participants. Organizations that purchase a promotional table will also be featured in the e-booklet of the conference. 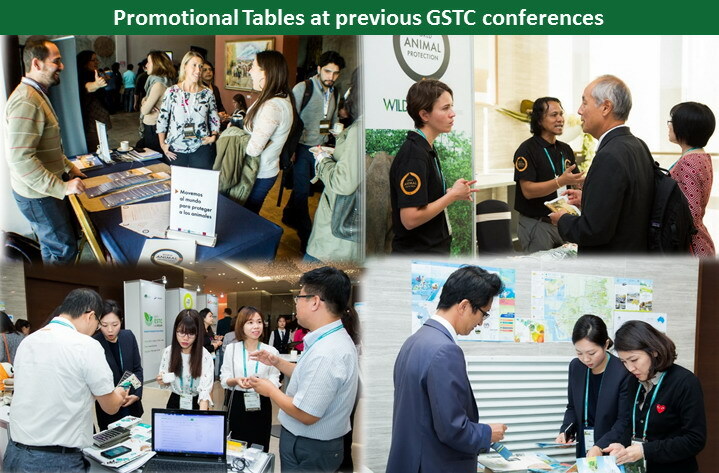 GSTC2019 Asia-Pacific Conference will include international and domestic tourism stakeholders involved in the development and promotion of sustainable tourism; including public sector, hotels, tour operators, academia, development agencies, NGOs, consultants, and more.